Before filing for divorce in a state, you or your spouse must have lived there for a minimum time set by law. Additionally, some states require one spouse to live in the county where the divorce will be filed for a minimum length of time prior to filing. If you are completing your divorce forms online, the DivorceWriter interview provides the information you need to select the right state and county for filing your divorce. Most commonly, the in-state residency minimum is three to six months, but the requirements vary depending on the state and the circumstances. 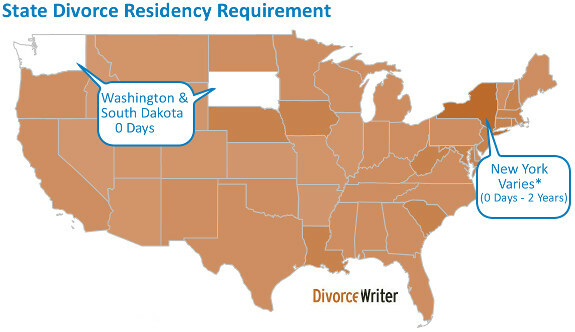 Alaska, South Dakota, and Washington have no minimum residency requirement and you can file for divorce in those states immediately upon moving there. In Idaho and Nevada, the spouse seeking the divorce need only live there for six weeks before filing. if the couple was married there. In New York, for example, the minimum residency requirement varies from no minimum to two years depending on which of those circumstances apply. The chart below indicates which states allow for a reduced minimum residence period. In which county should I file for divorce? Most states don't require a spouse to live in the filing county for a minimum time before filing for divorce there. Usually, the divorce is filed in the county where the filing spouse currently lives. When states do have a minimum in-county requirement, it tends to be less than the in-state residency requirement. In some states, you may file in the county where either spouse lives unless one spouse is still living in the county where the couple last lived together, in which case the divorce must be filed there. In other states, when both spouses live in-state, the divorce should be filed in the non-filing spouse's county if the spouses live in different counties. Alabama State: No in-state minimum if both spouses live in state. 180 days if only one spouse lives in state. County: No in-county minimum. If the Defendant lives in Alabama, file either in Defendant's county or the county where the parties lived together when the separation occurred. If the Defendant is not an Alabama resident, file in Plaintiff's county. Alaska State: No in-state minimum residency requirement. County: No in-county minimum. File in the county where either spouse resides. County: No in-county minimum. File in Plaintiff's county. If Plaintiff lives out of state, file in non-filing Defendant's county. County/City: No in-county minimum. File in the county/city where the Defendant lives. If the Defendant does not live in Connecticut, file in the county/city where the Plaintiff lives. County: No in-county minimum. File either in the county where the parties last lived together or the county where the Respondent resides. If neither applies, file in Petitioner's county. County: No in-county minimum. You can always file in Respondent's county. If Respondent doesn't live in-state, file in Petitioner's county. If both spouses agree on any other county, DivorceWriter provides a form for the Respondent to sign consenting to the jurisdiction of the court in the agreed upon county. Parish: No in-parish minimum. File in the parish where either spouse resides or where the spouses last lived together. Maine State: No in-state minimum if either: (1) the spouses married in state or (2) the breakdown of the marriage occurred in state. 180 days if neither of those apply. County: No in-county minimum. If either spouse lives in the county where they last lived together as a married couple, file in that county. If neither spouse does, file in the county where either spouse resides. Spouse filing for divorce must plan to live in state indefinitely. Must file sworn affidavit from a Nevada resident having personal knowledge of the filing spouse meeting the minimum residency requirement. County: No in-county minimum. File in the county where the Petitioner resides. Carson City filers will file at the Carson City District Court Clerk's office. File the county where Plaintiff was living at the end of the six-month period of irreconcilable differences. If Plaintiff did not live in New Jersey at the end of the six-month period of irreconcilable differences, file in the county where Defendant lived at the end of the six-month period. If neither spouse lived in New Jersey at the end of the six-month period, file in the county where Plaintiff currently lives. If Plaintiff does not currently live in New Jersey, file in the county where Defendant lived when service of process was made. New York State: None, if both spouses live in New York and the cause of the divorce happened in state. The spouses lived in NY while married at some point, but now only one spouse lives in state. Only one spouse lives in state and none of the factors above apply. County: No in-county minimum. File in Defendant's county if Defendant lives in state. Otherwise, Plaintiff may file in any county. County: No in-county minimum if filed in Respondent's county or 30 days if filed in Petitioner's county. Oregon State: None if you were married in state. 180 days if you were married in another state. County: No in-county minimum. File in the county where either spouse resides or in any Pennsylvania county if the spouses have agreed in a writing attached to the Complaint or by participating in the proceeding. County: No in-county minimum. File in Plaintiff's county as long as Plaintiff meets the 365-day in-state residency requirement. If not, file in Defendant's county provided Defendant meets the 365-day in-state residency requirement. South Carolina State: 90 days if both spouses live in state; 365 days if only one spouse lives in state. County: No in-county minimum. File in the county where (1) the Defendant resides at the time the divorce is filed, (2) the Plaintiff resides if the Defendant is a non-resident and cannot be located, or (3) where the parties last resided together as husband and wife unless the Plaintiff is not a resident of South Carolina in which case you should file in the county where Defendant resides. South Dakota State: No minimum residency requirement. Tennessee State: None if grounds for divorce happened in state. 180 days if the grounds for divorce happened in another state. County: No in-county minimum. File in the county where the parties resided together at the time of their separation or in the county where the Defendant resides. If the Defendant is not a resident of Tennessee or is incarcerated, file in the county where the Plaintiff resides. County/City: No in-county minimum. File in the county or city where (1) the spouses last resided together, (2) the Defendant resides, if the Defendant is a resident of Virginia, and (3) the Plaintiff resides, if the Defendant is a nonresident of Virginia. Washington State: No minimum in-state residency requirement. County: No in-county minimum and you may file in any county, regardless of where you and your spouse live in WA. If the non-filing spouse is a resident of West Virginia, the divorce may be filed in the county where the non-filing spouse lives. If the non-filing spouse does not reside in West Virginia, the divorce may be filed in the county where the filing spouse lives. The divorce can always be filed in the county where the spouses last lived together as husband and wife. Wyoming State: None if the marriage occurred in the state and the filing spouse has lived in Wyoming since the marriage date. Otherwise, 60 days. Do I have to file for divorce where I live? Most people don't realize that when spouses live in difference states, an out-of-state spouse can usually file for divorce in his or her spouse's state as long as the in-state spouse meets any minimum residency requirements. While this is somewhat unusual, it might be desirable if, for example, your spouse lives in a state with a shorter residency requirement or a significantly lower filing fee, but he or she simply doesn't want the hassle of being the one who files the paperwork. In such cases, the filing spouse may find it worth his or her effort to file for divorce out-of-state, even if it means traveling there for the divorce hearing. In divorces with minor children, however, it is generally best to file in the home state of the children, ideally the place where the children have lived for at least six months and will most likely remain indefinitely. Otherwise, the Court may not have jurisdiction over issues like custody and child support, which could complicate your divorce by leaving these important matters unresolved. Moreover, one or both spouses may want to modify custody, visitation and/or child support at some point down the road before the children reach adulthood. If you and your children are still living in the state where the divorce was granted, the modification process is much easier because the divorce court retains jurisdiction over those matters. As a practical matter, most couples live in the same state and easily meet the in-state minimum residency requirements for divorce. When spouses live in different states, either spouse's home state is probably an option for divorce, although spouses with minor children will find divorce the easiest when they file in the state where the children live. Where to File for Divorce You know which state and county you should file in, but what court do you actually file for divorce at? Divorce Filing Fees in the U.S.